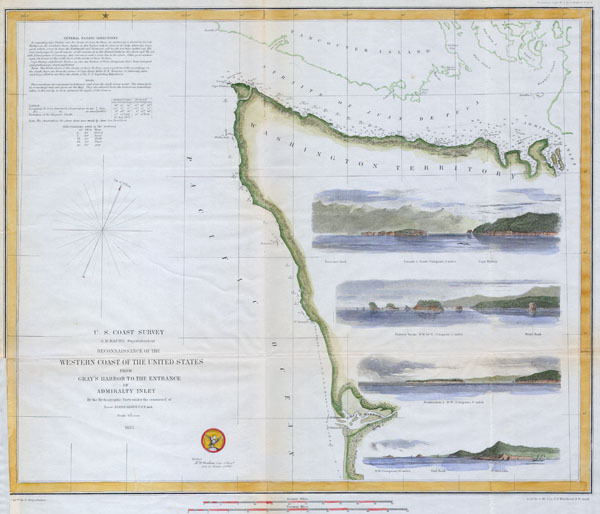 Reconnaissance of the Western Coast of the United States from Gray’s Harbor to the Entrance of Admiralty Inlet. Offered is a U.S. Coast Survey map or chart of the northwest part of Washington State and indeed, the northwestern most point of the United States. Extends from Vancouver Island in the north, through the Straits of Juan de Fuca, south as far as Gray's Harbor. Features four attractive costal views: Sail Rock, Destruction Island, Flattery Rocks, and Tatoosh Island. Numerous nautical notes and depth soundings dominate the left-hand side of the map. Today this regions is part of the American Indian Makah Reservation and the northernmost point of the Olympic Coast National Marine Sanctuary. Dated 1853. This map was created under the direction of A. D. Bache, Superintendent of the Survey of the Coast of the United States and one of the most influential American cartographers of the 19th century. Very Good condition. Margin repair on lower left border. Blank on verso. Rumsey 2470.058. Guthorn, P., United States Coastal Charts, 1783-1861, p. 207.